Jack Dorsey doesn’t eat anything on Friday or Saturday. Every other day of the week he eats exactly one meal, usually some sort of protein with a salad or green vegetables. He pairs that with some berries or dark chocolate for dessert. Occasionally, he has a glass of red wine. Now, I don’t know Dorsey. We’ve never met and we’re certainly not the kind of friends who text each other food-intake updates on the regular. But I know this is what the Twitter founder and CEO eats each day because he’s publicly vocal about it. 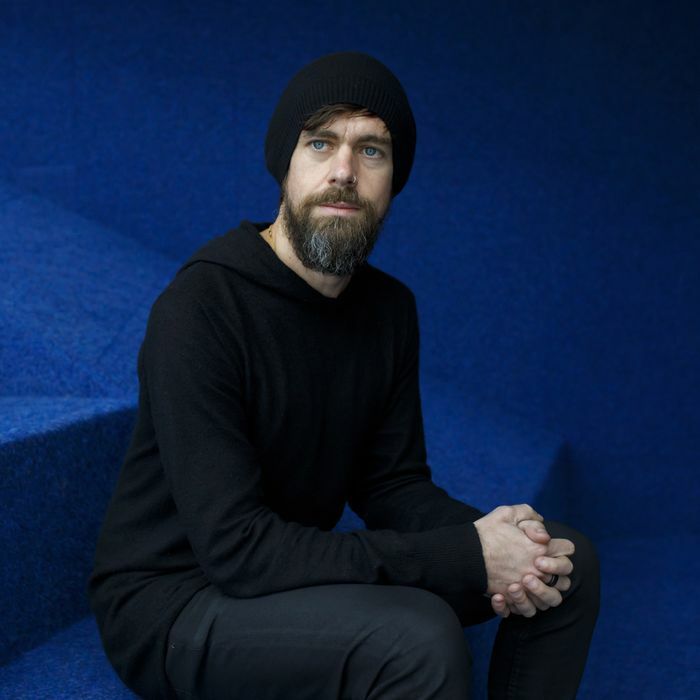 He’s tweeted about his restrictive eating habits previously and this week CNBC published an interview with Dorsey — cribbed from Dorsey’s appearance on a fitness podcast — detailing the billionaire’s so-called “wellness” habits. Along with the fasting, Dorsey meditates twice daily, walks to work, does HIIT workouts, and spends time in both a sauna and an ice bath before bed each night. There’s also a standing desk near an infrared light that purportedly “promotes cellular regeneration and anti-aging, and prevents injuries and illnesses.” He likes to journal and keep track of his sleep. All this seems totally fine. Mundane. The kind of boring stuff you’d expect to hear in a generic, list-style profile of the daily habits of somebody rich and famous. If my dude wants to submerge himself in freezing cold water in the morning to energize him for the day, okay then! As a proud member of the Girl Scout Polar Bear Swim Club — you wake at 6:00 a.m. to jump in a lake — I completely understand, and respect, this impulse. But the food stuff is on a different level. “The first time I did it, like day three, I felt like I was hallucinating. It was a weird state to be in. But as I did it the next two times, it just became so apparent to me how much of our days are centered around meals and how — the experience I had was when I was fasting for much longer, how time really slowed down,” Dorsey said about fasting. That’s not telling people they should buy some dumb light bulb that probably doesn’t do squat for their health. That’s evangelizing highly restrictive eating practices from a lofty platform where people might take them as universal truth. “Intermittent fasting, like most health-and-wellness behaviors, can exist anywhere on a spectrum that runs from very dangerous to potentially beneficial, depending on who’s doing it and how it’s implemented,” wrote Amanda Mull at The Atlantic earlier this year when Dorsey first tweeted, to much criticism, about his health habits. Dorsey is, hopefully, doing all this under constant supervision from medical professionals he can afford since he’s, you know, a billionaire. But that doesn’t get mentioned, so that’s something we have to assume is happening. And for the rest of us, who aren’t billionaires, likely isn’t an option. The Twitter CEO is certainly not the first Silicon Valley type to espouse the benefits of a biohacked life. Biohack here being newspeak for streamlining those pesky things humans need to do to survive. Things like eating and sleeping. Don’t want to waste time cooking and chewing? Chug a Soylent meal replacement. Spending too much time in dreamland? Sleep twice a day in four-hour increments to up your productivity. Dorsey’s fasting plan amps that up, eliminating the need to spend much time eating altogether. Reading about Dorsey’s potentially harmful food habits, I found myself remembering an interview from two years ago with J. Crew’s then-president and creative director Jenna Lyons where she told Bon Appétit she eats the same thing every day for lunch. For several years it was two orders of tomato soup from a specific café. More recently, she’d switched to a Cobb salad from New York restaurant Westville. (Her assistant would bring a hard-boiled egg each day, since the restaurant didn’t provide one.) As someone who has struggled with disordered eating, that tidbit sent up a red flag for me. To be very clear, I’m not saying I think Lyons has or had an eating disorder. But the ritual of sameness, of using limitation as a form of control, stuck out, reminding me of times in my life where meal was synonymous with a bowl containing only baked chicken and salad-bar broccoli topped with balsamic vinegar and, of course, no oil. Dorsey’s comments didn’t raise a flag for me. They looked like the front of the United Nations building. But it’s easy for Dorsey, a man who’s hacking his own biology, to say these things and be defended online. I’m frustrated that I’ve been conditioned to raise an eyebrow when a powerful woman like Jenna Lyons says she only eats two tomato soups for lunch each day — but that when a powerful man, Dorsey, describes eating habits that have clear potential for real health damage, people will rabidly defend him. It’s not that people on Twitter aren’t voicing concern for him. They are. A female journalist criticizing Dorsey’s eating habits was harassed into leaving Twitter on Tuesday. A perfect anecdote to explain why Dorsey continues to be able to talk about these things with a striking candor. Nobody made him fire up Twitter in January and start telling the world how infrequently he eats. Doing a fitness podcast doesn’t seem like it should be top of the list of concerns for a guy who runs a tech platform plagued by well-documented violence and harassment problems. Dorsey is talking about these things because he’s proud of them. Because he’s interested in sharing what he’s doing and learning. And he’s sharing that information without even the slightest caveat. Must be nice to be a tech dude.